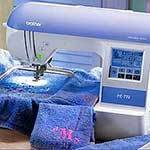 If you want a combination sewing and embroidery machine packed with easy-to-use features, you can’t beat the Brother SE400 Computerized Embroidery and Sewing Machine With USB Port at this price for value for your money. 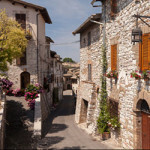 It’s a lot of fun and very user friendly! The online help and step-by-step instructions from the LCD screen are very easy to follow. Even if you are a complete beginner, you’ll be up to speed and creating your very own fashionable projects in no time at all. Choose from 67 built-in sewing stitches, 98 stitch functions, and 10 styles of one-step automatic buttonholes for all your creative sewing projects from constructing fashionable clothes, home decorations, and quilting to just basic altering and mending. See all the sewing stitches. Imagine the fun of creating trendy fashions with the added touch of embroidery embellishment. With the 70 built-in embroidery designs, five monogramming fonts, and 120 frame pattern combinations, you can start adding your own style to your projects. 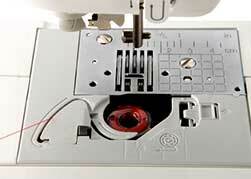 The start / stop button allows you to sew without the foot petal. If you have lower back problems, you may find sewing a lot more comfortable without using the foot petal. Also, you may find the speed easier to control using the button. The super-bright, backlit LCD touch screen makes it easy to select and edit embroidery patterns so that you can create the perfect designs for your unique creative project. No more fussing with stitch width/length dials. The on-screen guide reminds you how to do any operation at a glance. Because the Brother SE400 is smaller and lighter than other sewing and embroidery machines, it’s easy to carry around — even to classes and on trips — and put away after each use if you don’t have the space to leave it out. The built in automatic push-button thread cutter makes garment sewing and embroidery fun and effortless especially when doing a large project. 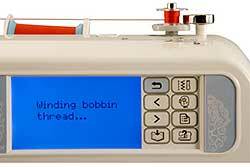 Automatic features make it easy to thread both the machine and the bobbin. There is no need for an extra bobbin threader unless you own a boutique. Saves lots of wear and tear on your eyes and fingers. In the box 7 sewing feet (buttonhole, overcastting, monogramming, zipper, zigzag, blind hem, and button fitting), embroidery foot, seam ripper, 4 bobbins including clips, needle set, twin needle, cleaning brush, eyelet punch, screwdriver, touch pen, 3 spool caps, spool pin, spool net, foot controller, scissors, disc-shaped screwdriver, 4×4 inch embroidery hoop, accessory bag, dust cover, and manual. USB Cable included. 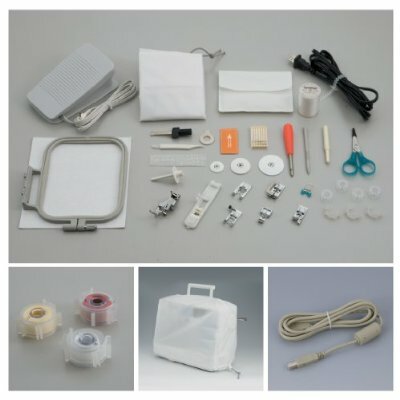 The Brother SE400 Computerized Embroidery and Sewing Machine comes with almost everything you need to get started on your sewing and embellishment projects quickly. It even comes with 7 sewing feet plus an embroidery foot so that you don’t have to spend extra money for attachments like you do with some other machines. You only need fabric and thread. And for embroidery, you’ll need embroidery thread in various colors, fabric or something to embellish such as a household item, and stabilizer to keep the fabric from puckering. The Brother SE400 comes with all this . . .
USB cable to attach the embroidery machine to your computer for importing embroidery patterns. 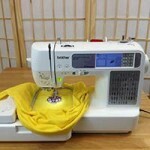 The Brother SE400 Computerized Embroidery and Sewing Machine With USB Port offers a lot of cool features for such a bargain price and is the best combination embroidery and sewing machine for the money. But you can spend much more than you have to depending on where you buy. And be sure to check for possible hidden costs such as shipping and sales tax. People love the Brother SE400 with the updated technology of a USB port and cable that attaches to your computer for easy importing. Check out my Brother SE400 review.